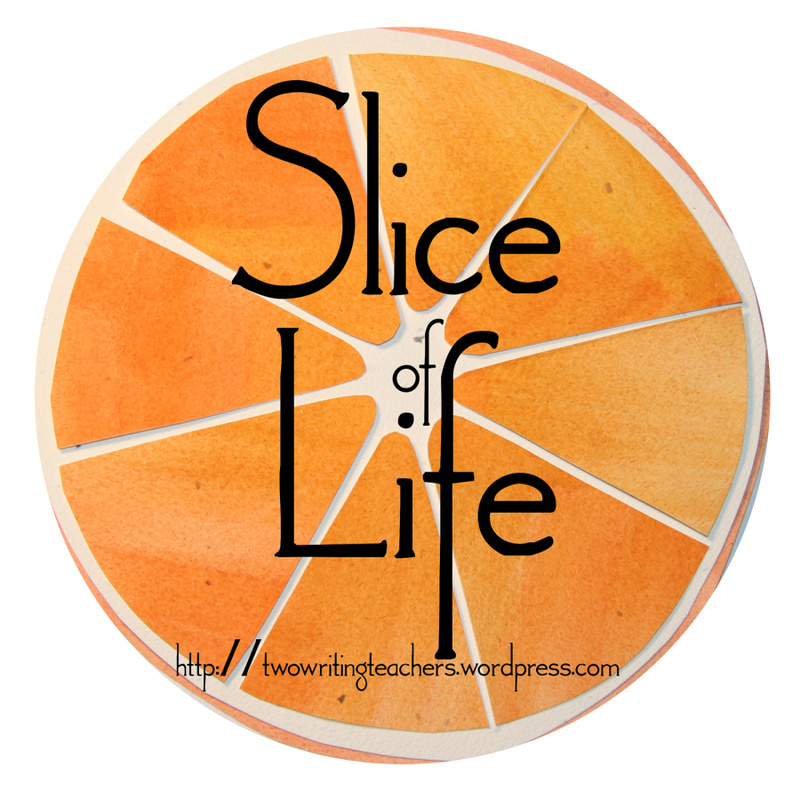 Today is Slice of Life Tuesday – the weekly writing challenge hosted at “Two Writing Teachers“. I am late posting but felt I needed to. One of the practices I have returned to is creating a dreamboard on the full moon. I had done this for a couple of years and then fell away from it. And I have missed it. 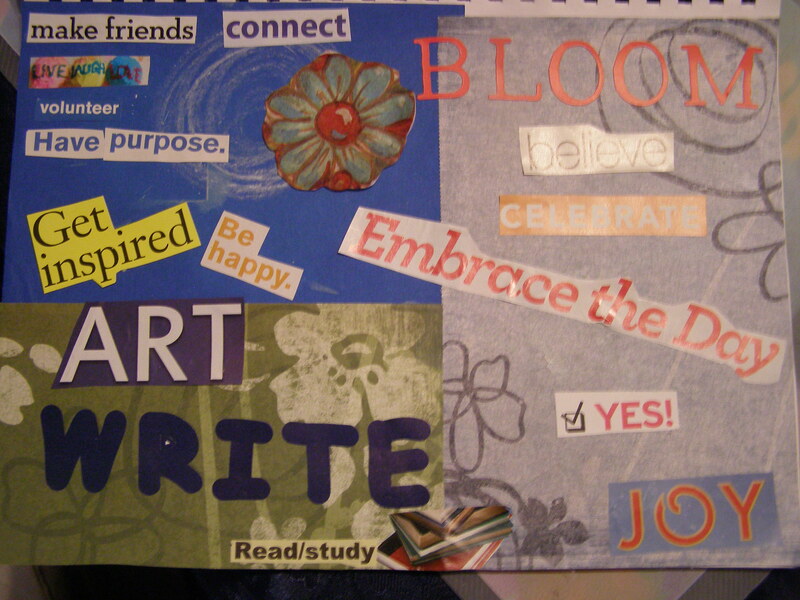 Creating a dreamboard is an intuitive process. This month it is the Full Hunter’s Moon and as with each full moon, there is a question to ponder as you sift through images and words/phrases. “What dreams have you set your sight on? As I created my dreamboard, the overriding dreams were to create, be inspired – both in wrtiting and art. In five days I start NaNoWriMo as well as PiBoIdMo – two writing challenges I have done before and been successful at. I am hoping that happens again. I am also taking part in AEDM – a daily art challenge. I need these challenges, as the past few months have not been as productive as I would have liked. I seem to have been stalled – reading a lot, but not participating as much. The first words I found were the ones I placed on the right hand side of the page. Bloom, believe, Joy – three of my one word for the year. I need to be reminded of their power. Creating this board went quickly and really does represent what I am setting my sights on this coming month. What dreams will you set your sights on?? Anywone else taking part in NaNoWriMo? or PiBoIdMo?? 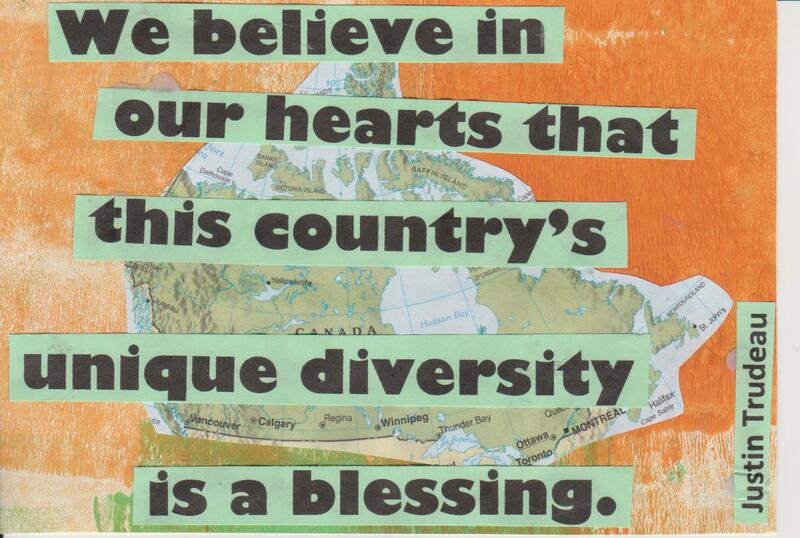 Yesterday Canada elected a new Prime Minister and a new optimism can already be felt. The eleven weeks of this campaign was one of the worst in Canada’s history. Politics of meanness, division, and even ugliness ruled in Harper’s government. This election became for many of us a referendum on Stephen Harper. I have spent weeks on Twitter and Facebook expressing my concern about another four years of Harper and so many others joined the fight. I hoped for a Liberal minority – not hoping for much more. As the results began pouring in last night, it was amazing to see a tsunami of red spread across Canada. Justin Trudeau, with his vision and optimism, his positive campaign, inspired so many to vote for him. His acceptance speech last night was visionary and full of positivity for the future of our country. Trudeau made history as well– for being the first son to follow his father as Prime Minister; for moving from 35 seats and in third place in the previous government to 185 seats this time. Amazing. I had despaired about our country under Harper and it felt like a huge weight had been lifted with Trudeau’s win. I am filled now with optimism that we can return to the open, accepting, positive place on the world stage. Thank you Canadians for stepping up and repudiating Harper’s mean-spiritedness and denial of democracy. Each Sunday and Wednesday the ROW 80 community posts their progress from the preceding week. This, really helps us focus on our writing and what goals we want to achieve. The ROW80 community is such a supportive one. Wednesday’s ROW80 check-in was to close to have made much progress so I chose to wait til Sunday’s check-in. I still don’t feel as though I have made much progress but have worked on several projects. Write daily – at least 500 words daily. As I am working on my blog wvery day I am writing some but not 500 every day. Take part in NaNoWriMo in November and write 50,000 words. Have started planning for this. Take part in PiBoIdMo in November and come up with at least 30 pix book ideas. Take online writing course and enter at least one writing contest.Will be starting a new course tomorrow. Revise at least one novel. Still working on one novel. Take part in #31 Days of Writing on my art blog in October.Yes – have blogged every day. Write at least 2 other posts weekly besides ROW80 posts. Yes- but on my art blog. Read 3 books on writing as well as articles Have read several articles. Read something for pleasure Yes – every day! This has been a joy indeed. Take part in AEDM in November. Each Sunday and Wednesday the ROW 80 community posts their progress from the preceding week. This really helps us focus on our writing and what goals we want to achieve. The ROW80 community is such a supportive one. Today marks the first week of the 4th round. Even though I set several intentions/goals, I have not achieved as much as I had hope. This past weekend was Thanksgiving in Canada and I hosted two full turkey dinners. Lots of visiting, eating and more eating! So between preparing for the events, cooking and visiting the past four days have been a bit hectic. I have also been working to reorganize my writing files- reading the stories and novels I have finished or am working on. That took longer than I thought it would. But it gave me a good look at what I have written and what needs to be finished or edited or even rewritten. Now moving forward I have a template of my writing. I have been doing a lot of reading and working on the online book study of “Writing Irresistible Kidlit”. I am enjoying it so far. 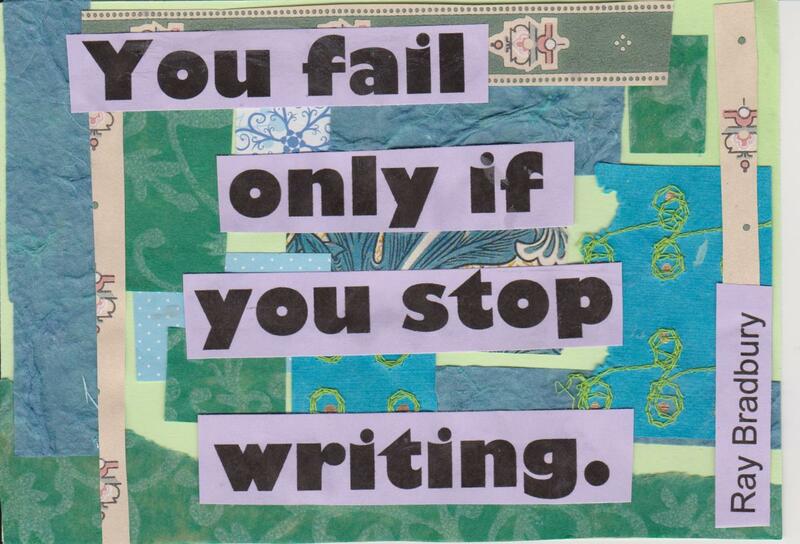 As I begin week two, I need to focus on writing daily. I stepped back from writing near the end of Round 2 and did not participate in Round 3. I have missed the community and the accountability. I am more than ready to get back into a writing routine and participate in ROW80. Here are my goals for Round 4.:. Write daily – at least 500 words daily. Take part in NaNoWriMo in November and write 50,000 words. 4.. Write first draft of chapter book or middle grade novel. Take online writing course and enter at least one writing contest. Revise at least one novel. Take part in online study group of “Writing Irresistible Kidlit”. Take part in #31 Days of Writing on my art blog in October. Write at least 2 other posts weekly besides ROW80 posts. Work on updating this blog.